There's nothing like kicking off Autumn with some seasonal door-topia. Mastering the art really begins with the most basic of ideas! Choose the mood you want your front porch to display - perhaps warm, home-y or simply "go away". 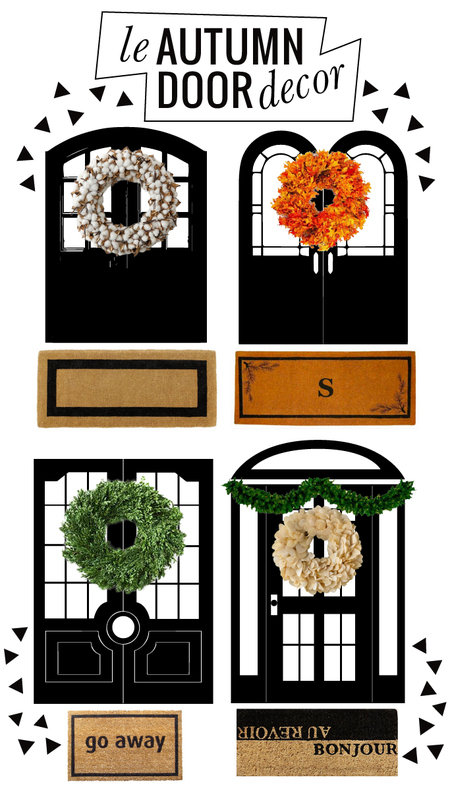 You may start with either the wreath/or the doormat but both are essential, it's highly likely a core rule signed in the coveted 'Autumn Door Confidential'. Another grand idea for those of you reading - I've heard gifting wreaths has become quite the deed-y. So for the naked-doored friends and family you hold dearest, ship 'em a grandeur festoon + you'll be coined the sincerest! If you're afraid it may insult, leave a note along with, tell 'em I made you do it and hope they dismiss. They'll think of you every time they step foot on the porch and be ever-so-grateful for the piece they adore! How do you all dress your Autumn Door? Enlighten me with your unique decor!